Pavel Byezgachin in the sole owner and President of Autumn Gold Landscapes. 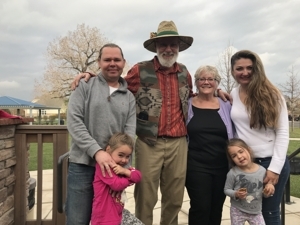 He moved to Colorado with his family in 2016, with the intention to own and manage Autumn Gold Landscapes. He considered it to be a unique business with excellent reputation and potential. Pavel has a unique experience in construction/landscaping and business administration. Since 2005 to 2015 he was holding a position of Project Manager in big construction company. Before that (2000-2005) he was running small construction/landscaping business in Moscow. To all our friends, old and new. After 33 years at Autumn Gold Landscapes, Richard and Debbie Hoverman have decided to retire! This journey has been a real blessing. Many friends and creative, beautiful projects along the way. There comes a time in one’s life when it’s time to say goodbye. One chapter ends and another begins. Fortunately the new chapter for Autumn Gold begins with Pavel and Lyuba Bezgachin who are the new owners. They come here with their children looking to make a new life for themselves and to continue the legacy of Autumn Gold Landscapes. I hope you will embrace them as you embraced us through the years! Thanks for the memories. 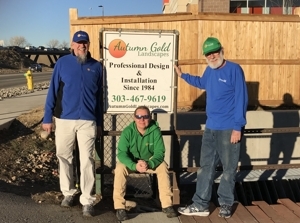 We’re happy to introduce you 3 generations of Autumn Gold Landscapes. AGL was founded by Steve Tanner in 1984 (on the left). In a couple of years he invited Richard Hoverman (on the right) to work for AGL and after Steve retired in 1998, Richard took over the company and had been successfully running it for another 18 years . In 2016 Richard felt like it was time for him to retire and AGL was taken over by Pavel Byezgachin. Pavel got a unique experience in construction/landscaping totaling to 23 years. Starting from carpenter assistant in 1996 and building up his career to a Project Manager position in a big construction company (Mercury Engineering). 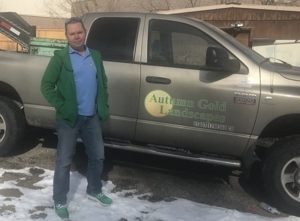 Pavel is committed to run Autumn Gold Landscapes for another good period of time, keeping high standard of service that AGL’s Clients have got used to and make Autumn Gold Landscapes grow and increase the range of service. Steve and Richard are giving a great help, staying around, as they really care for the “baby” they had grown up.